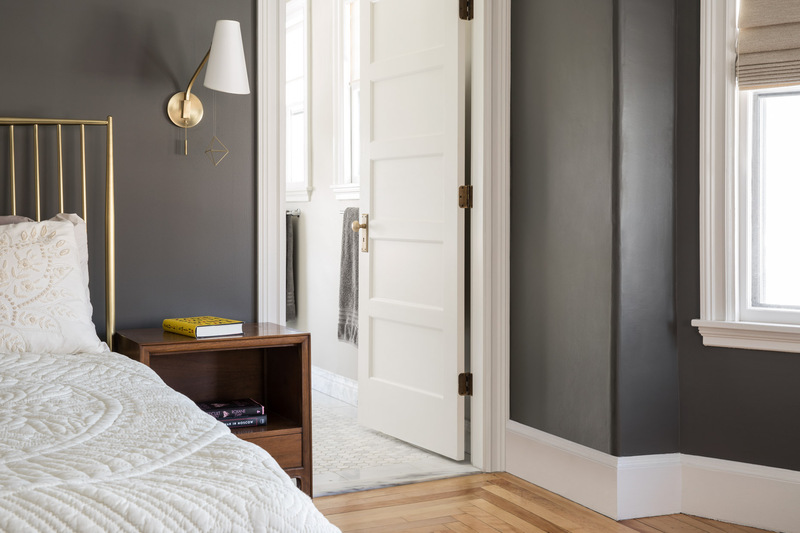 A complete interior renovation to an old home in a quiet neighborhood in Portland. One of the biggest challenges was figuring out how to open up most of the first floor without complicating the structural integrity of the two floors above. To do this, we removed the existing baring walls and added a large, exposed steel “I” beam which was painted white. The kitchen includes a large oval island with curved shaker style doors and new appliances. Flow was improved throughout the house with the removal of some interior walls and adding large structural members, which are on display, allowing for more natural light from the existing windows. The Master Suite has a new walk- in closet and a complete bathroom remodel. The bathroom vanity has a natural butternut wood vanity with bookmatched door panels. The vanity is wall hung on two sides and a custom made forged steel “x” brace supports on one corner. On the second floor, there is a exposed preexisting arch, in order to reveal as much of the true character of the old house as possible.